This family of lacecap and mophead hydrangeas is hardy from USDA zone 4 to 9 and bloom on new wood. These can take full sun in most areas but southern gardens, Arborescens will require some shade. This family is native to the United States. 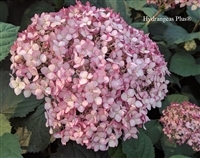 Blooms come early in the summer/late spring and will keep going through the summer into fall. Prune in early spring to keep bloom size smaller and stems from flopping. Plants leaf out later, up to 3 weeks after macrophylla.